Our children are our greatest treasure. When we look into their eyes, we see a little person with amazing potential. Baby’s brain develops with fascinating speed, creating new connections every second. Maria Montessori identified it by referring to an absorbent mind. Today I would like to talk about a book written by A.M. Sterling “Montessori at Home Guide: A Short Introduction to Maria Montessori and a Practical Guide to Apply her Inspiration at Home for Children Ages 0-2”. There is so much, but so little written about implementing the Montessori method from birth. People hear terms like “sensitive period” or “prepared environment” with no understanding what lies behind it, how it translates into practice. I genuinely feel sad for people who say: “How I wish I knew it all sooner”. Well, truly, babies do not wait for us to catch up. Days are long, but years are short. They grow and develop, mature and gain the understanding of the world every single moment. If you are a new parent or know someone who can benefit from learning more about Montessori from birth, this book will guide you in the right direction and equip you with the right knowledge and understanding of the Montessori method. “Montessori at Home Guide: A Short Introduction to Maria Montessori and a Practical Guide to Apply her Inspiration at Home for Children Ages 0-2” will provide an overview of 5 basic principles and present a brief introduction to Montessori philosophy. You will learn what IS the absorbent mind and get an introduction to every developmental period: from 0-6 mo, 6-12 mo, 1-2 yo. Ashley and Mitch Sterling talk about milestones, best Montessori practises with babies at home for each period, give toy recommendations and connect it to the Montessori philosophy. “..children are capable of educating themselves. Dr. Montessori believed that children who are actively involved in an environment that has been properly and safely prepared will exercise their freedom and literally educate themselves. “In this book, we will discuss key behaviors to implement Dr.
• Making the child the center of the learning process. the occasional diversion of attention if needed. • Preparing the learning environment. • Respect each child and model respect”. This book was a great opportunity to refresh my knowledge and reminded me that respect for a child is the uttermost priority. 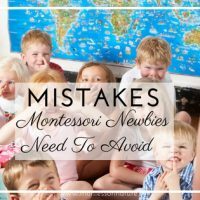 I absolutely trust that the authors described and pointed out some of the essential aspects of the Montessori method when it comes to very early years. I found that one of the biggest advantages of this book is that it is written in a very clear style, which makes it easy to remember and put ideas into practice. I consider this book is a great new parent guide and a perfect present for soon-to-be parents and childminders who are interested in the Montessori method. Please, visit Sterlings’ website to enter the giveaway! There will be two winners. The lucky ones will receive a paperback copy of ’Montessori at Home Guide: A Short Introduction to Maria Montessori and a Practical Guide to Apply her Inspiration at Home for Children Ages 0-2 ’ signed by A. M. Sterling. ’Montessori at Home Guide: A Short Introduction to Maria Montessori and a Practical Guide to Apply her Inspiration at Home for Children Ages 0-2 ’ A. M. Sterling.